The quality of our meals is just one reflection of our dedication to providing the highest level of service to our guests. We offer a diverse menu under the supervision of a dietician and cater to each guest’s individual needs. Carriage Manor offers a variety of services to ensure the physical, social, and emotional well-being of each guest. Full time nursing attendants provide assistance with personal activities and monitor all medical needs. We maintain consulting RN’s on our medical staff and offer healthcare supervision, with a consulting physician on call 24 hours a day. 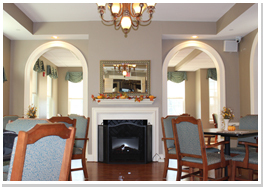 As a Medicaid & VA approved facility, Carriage Manor serves the needs of private and government assisted guests. The services of professional counselors are available to assist you in reviewing financial plans and payment options, and to help determine a guest’s qualification for government and other assistance programs. Carriage Manor’s guests take an active role in their future. They elect individuals to serve as representatives in group council meetings, where they take pride in the ability to participate in the operation of their facility. These representatives play an important part in determining the services and activities offered. We understand the difficulty that can be associated with determining the future of a loved one. We provide the assistance to facilitate this process so you can be confident that your decision to select Carriage Manor is the right one. This helps us develop a personalized care plan that considers guest’s individual likes, dislikes, preferences, and needs. The profile aids the process of assimilation and ensures a speedy and comfortable transition to residential care living. 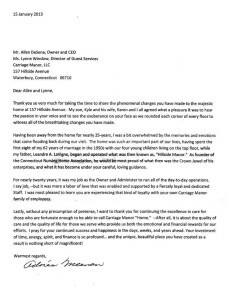 The following letter was sent to our facility recently, and we wanted to share it with you because we think it helps explain the history and the future of Carriage Manor very well. A house is just wood and stone – a home is so much more, call us today to see what our home is all about.